As many of his well-known proverbs attest, King Solomon advised action tempered by prudence and wisdom. “Say to wisdom: Thou art my sister: and call prudence thy friend,“ he tells us in Proverbs 7:4. Now in what’s intended as an act of prudence after the government shutdown, the Federal Reserve has opted to continue its housing stimulus plan. But the interest rates it’s meant to keep low are rising anyway – and that’s putting a chill on new loans. Even as the US braced for the shutdown, concerns surfaced about the vulnerability of the housing rebound and its potential impact on the economy as a whole. So, in an effort to keep housing activity from grinding to a halt for an unknown period of time the Department of Housing and Urban Development continued to staff – at least in a limited way – government –backed mortgage lending programs through the FHA, Fannie Mae and Freddie Mac. Since government backed mortgages account for the majority of home loans in the country, they reasoned, mortgage applications could still be processed and home sales could still go on. Responding to the shutdown, the Federal Reserve, which had been poised to taper down its year-old stimulus plan for buying up billions of dollars worth of mortgage backed securities, opted instead to continue the program at its current levels. Because the plan helped to hold down interest rates, it was expected to help keep the housing market’s recovery on track – and with it, other areas of the economy. But even with the intervention of the stimulus and its artificial push to lenders, interest rates have been climbing – from near-historic lows of around 3.5% a few months ago to around 4.5% and above. And while that’s still relatively low compared to the rates that might hold without the stimulus, it’s enough of an increase to depress applications for mortgages and other types of loans. In a new report by The Motley Fool, the national Mortgage Bankers Association released numbers indicating that the rate of mortgage applications has fallen by 51% since May 2013. That’s a decline attributable largely to higher rates, but also to skittish lenders watching the evolution of the Qualified Mortgage Rule, which imposes tighter lending standards. 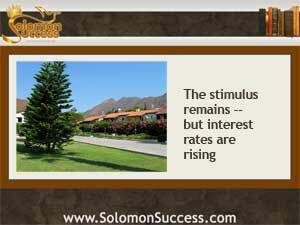 Rates declined slightly after the announcement that the stimulus plan would remain in place for now. And, industry experts say, applications for home purchases remain on track, with only a slight decline over the past few months. Housing prices, too, continue to rise – a promising sign for the health of the recovery. New Bank Fraud Settlement, New Lending Rules? The Shutdown's Over: Now What Happens to the Stimulus? Gold Prices Down, Interest Rates Up? Is It Time for Mortgage Rates to Rise? Can Tighter Lending Standards Strangle the Stimulus?